Great SMS Marketing cases studies are not as rare as you think. When a brand can focus on one strategy for growth, you will have great results. BestCigarPrices.com, an online leader in the premium cigar sales business, teamed up with SlickText.com, an industry leader in text message marketing. The strategy was simple. Best Cigar Prices used two methods to grow their opt in list. They launched a Facebook PPC campaign and rotating banner on their homepage. Both ads followed all proper compliance laws and provided a clear purpose to the end user. 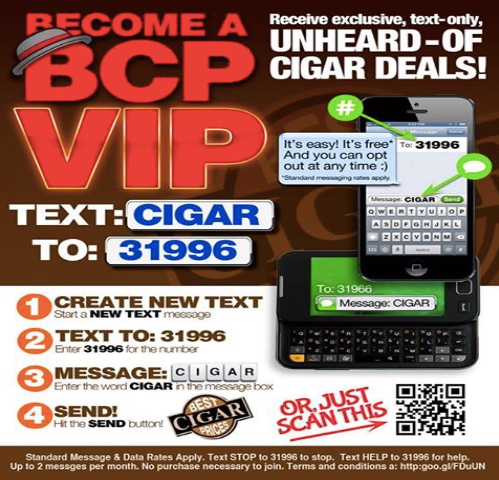 On Facebook and the homepage, customers were presented with the exclusive opportunity to join the “VIP” list by texting the keyword CIGAR to 31996. They also were able to scan a QR Code, which set up the text message for the user and allowed them to hit send to sign up. One key point about QR codes is that only about 60% of cell phone users have smartphones, and of those users only about 20% have an app capable of scanning a QR code. For this reason, never put too much emphasis on QR codes, but still present for flare. BestCigarPrices.com used SlickText’s “Age Verification” feature to verify that participants were 18 and older before joining the list. When the customer texted CIGAR to 31996 they received an age verification message asking them to reply with their birthdate. SlickText’s platform then calculated and checked against the age, either adding them to the list or denying the participant based on age. BestCigarPrices.com also used what we call a “staggering growth” strategy. This offers no initial incentive, then as the list grows, you might reward your subscribers with a free item, dollar or percentage value off, or useful bit of information. The third stage to the staggering growth strategy would be running a text-to-win contest. Remember, Rome wasn’t built in a day so stay consistent. BestCigarPrices.com was able to accumulate 80 opt ins in the first 8 hours of launching, and keep in mind, they had no incentive for joining the list. During BestCigarPrices.com strategy development session, they developed many other possibilities for growth, which included text to win contests, email campaigns, online order box stuffing, twitter taglines, installing a web widget sign up box on their site and many others. Each strategy was developed specifically for their need. If you are interested in getting the ball rolling with your own SMS Marketing campaign, get in touch with us. We would love to help you grow and experience similar results using our platform. We can develop a specific strategy based on your business. Contact the SMS Marketing Professionals from SlickText.com today at 1-800-688-6290.